« Centennial Woods 4/16/18: Spring??? So, this was my final visit to my phenology site in Centennial Woods. I went around 7pm last night, so it was starting to get a little darker out, although the sun didn’t set until almost 8. Finally there is no more snow anywhere in Centennial Woods, which is honestly a relief because I don’t think my soul could take any more snow and freezing temperatures. 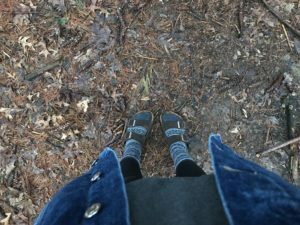 But, the snowy, slushy trail I experienced last time has been replaced by an insane amount of slippery mud, making my journey down the path in my birks a bit risky. Once at my site, there were hardly any changes from my last visit. The buds on the trees are more pronounced, but none of the deciduous trees are flowering or have any leaves yet. There are quite a few more ferns on the ground, and the moss on the trees is a much brighter green than before, likely due to the amount of rain we have gotten. I also heard many more bird calls than before, including crows, cardinals, and chickadees, and I saw a bunny on my site, although I scared it away with my presence. Overall, I really think nature and culture intertwine at my place. 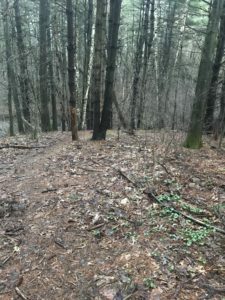 In the past, much of the land in centennial woods was cleared and used for agricultural purposes, and logging, which were/are huge industries in Vermont. It is known that the land was cleared for these purposes because most of the trees are at the same stage of growth and development currently, meaning they all started to grow at the same time. As far as nature and culture intertwining in present day, Centennial Woods is a UVM Protected Area, and is used for all sorts of educational purposes for UVM students surrounding schools. Plus, a lot of people from the Burlington area go to Centennial Woods to hike and get out in nature. Lastly, the woods back up to a neighborhood, and is right along the UVM campus, further connecting it to nature. So, it is clear that nature and culture are deeply intertwined at Centennial Woods. Despite going to the woods often, I do not really consider myself a part of my place at Centennial Woods. 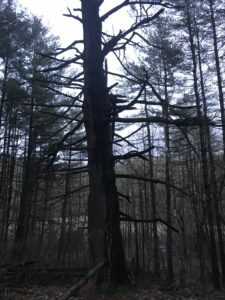 I don’t think I am a part of the woods because I have made essentially no impact on the land or species that reside there, as I am simply an occasional observer of it. But, I have been there at least a dozen times, I have taken the time to get to know it, and I feel a connection to it. 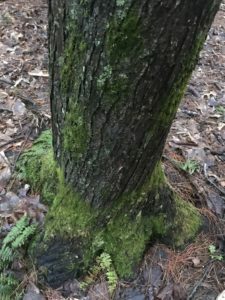 All of this makes my spot in the woods is meaningful to me, because I frequent it often, find it calming and enjoyable, and have learned a lot about its history and makeup. So, I think I consider it a part of me more than I consider myself a part of it.